The driver shortage is the result of an aging workforce, high turnover and increasing freight demand. 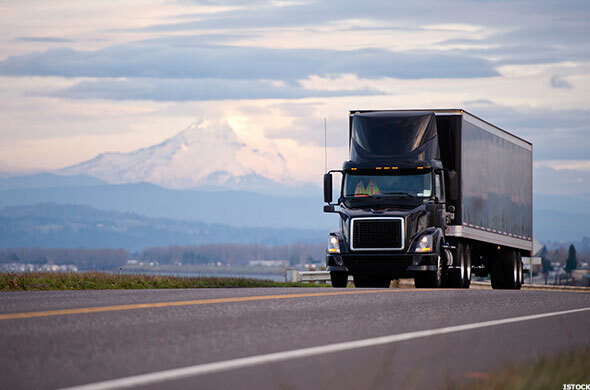 Amid an otherwise strong corporate earnings environment, cost inflation within the trucking and freight industry is becoming a real concern for many companies. "It's a real bear," Tyson Foods (TSN - Get Report) CEO Tom Hayes told TheStreet about the inflationary pressures of the shortage. Approximately 60,000 drivers are needed to meet robust demand for trucking services, and that may be a conservative estimate. The shortage could be upwards of 100,000 or more, Seaport Global Securities LLC analyst Kevin Sterling told TheStreet. The driver shortage stems from several factors, according to Sky Harbor's Director of Research Michael Salice. Those factors include an aging workforce, high driver turnover rates (above 90% at present), reduced capacity as a result of regulatory changes, increasing freight demand, inflationary pressures, and "lifestyle priorities" that make competing industries more attractive. 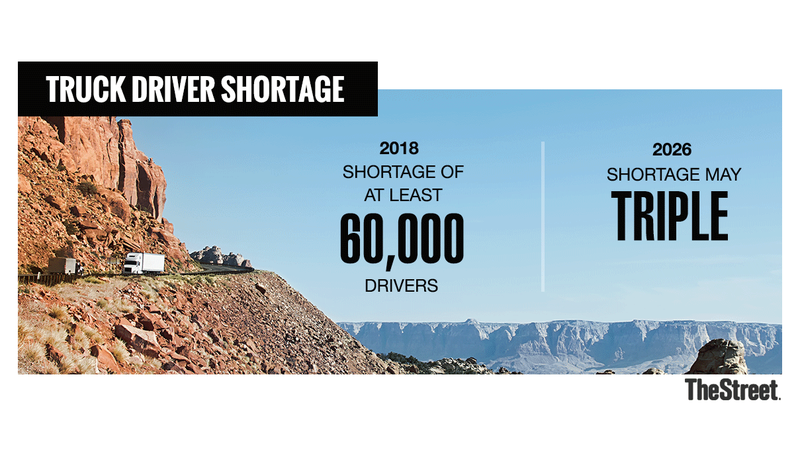 Considering these issues, "industry experts fear the current shortage (~60,000 drivers) may nearly triple by the year 2026, absent any meaningful changes," Salice wrote in a research note. Queue the earnings warnings from consumer companies. The leading issue is turnover, according to Kara Deniz, the senior communications coordinator for the International Brotherhood of Teamsters, which is a labor union of drivers and warehouse workers. "High turnover in the industry ties back to dissatisfaction," said Deniz. "Turnover is a reflection of poor wages and working conditions, such as being away from families for a long period of time." The trucking industry boomed in the 1980s as a result of deregulation, and many small trucking companies popped up during that time, Sterling said. "Fast forward to today and the next eight years, people are retiring," he said. The obvious answer to solving the shortage dilemma, Deniz suggested, is for trucking companies to raise wages, but that could also result in higher costs for businesses and their customers. "Upward pressure on wages (to divert talent away from competing industries and close the driver shortfall), ever-increasing healthcare costs, and regulatory changes are likely to exert further upward pressure on freight costs over the next several years," Salice said. Higher gasoline prices have also exacerbated the overall increase in freight costs, the industry follower pointed out. Gasoline prices have climbed to a national average of $2.88 per gallon, up from $2.49 at the start of the year, according to the motorists' group AAA. Diesel prices also have jumped to $3.17, compared to $2.44 a year ago. To be sure, the effects are already being felt by customers. Retail giant Walmart Inc. (WMT - Get Report) acknowledged that rising transportation costs hindered its first-quarter gross margin. "We did see a tick up in transportation expenses," Kary Brunner, Walmart's director of investor relations, said during a May conference call with analysts. Brunner called the transportation costs one of the "main drivers of gross margin headwinds." On the other hand, not all shipping companies suffer from the same shortage concerns, which suggests competition and consolidation in the highly fragmented space could heat up. Shipping giant United States Parcel Service Inc. (UPS - Get Report) is one example of an industry bellwether that may find it easier to navigate the dwindling driver base. "We also have the extreme luxury of having a ready pool of drivers from our small package delivery side of the business," UPS spokesman Dan McMackin told TheStreet. "Those drivers go through a bid process and they can bid into the tractor-trailer ranks. We pull people for the small package delivery business from our part-time package handlers." UPS does have issues finding drivers during the peak holiday season, but tries to make "the job more attractive based on the fact that most, if not nearly all, tractor-trailer drivers are out and back in the same day; they don't sleep on the road somewhere, in a truck or a motel," McMackin said. FedEx Corp. (FDX - Get Report) and Amazon Inc. (AMZN - Get Report) did not respond to TheStreet's request for comment as to whether the driver shortage has affected their businesses. Amazon is a holding in Jim Cramer's Action Alerts PLUS. But the shortage of drivers has prompted some trucking companies to turn business away, leading shippers to rely on the rail industry at times, the Federal Reserve wrote in its May Beige Book. One member of Congress believes the truck driver shortage could be resolved through legislation. California Republican Representative Duncan Hunter has introduced DRIVE-Safe Act, which would establish an apprenticeship program for individuals under the age of 21 who hold a commercial driver's license and prepare them to drive in interstate commerce. Currently, federal regulations restrict CDL-holding drivers from operating across state lines until they are 21 years old. Seaport's Sterling said the legislation "potentially could help," considering the tight labor market right now. That said, bringing in younger drivers doesn't solve the issues that have plagued the industry, Deniz said. "The high turnover and working conditions don't go away with a younger cohort of drivers," she said. And even then, there a new roadblocks headed for the trucking industry. Ford Motor Co. (F - Get Report) , General Motors Co. (GM - Get Report) , Tesla Inc. (TSLA - Get Report) , Alphabet's (GOOGL - Get Report) Waymo and automotive and technology companies are all working hard to launch autonomous driving vehicle programs within the next several years. Sterling, however, said autonomous semi-trucks are "a long way away," as the technology first needs to be mastered for passenger vehicles before moving to tractor trailers. 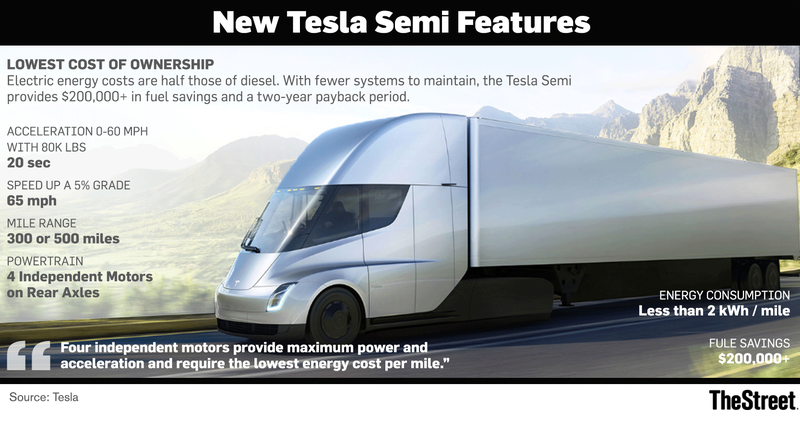 The Tesla Semi may not even be cool enough to attract truck drivers. "Think about planes; they have autopilot but still have a pilot," Sterling said. "[Autonomous trucks] would have to have a driver, at least initially." That hasn't stopped billionaire Warren Buffett from voicing his concern. "Autonomous vehicles would hurt us if they spread to trucks," Buffett told shareholders at Berkshire Hathaway's (BRK.A - Get Report) (BRK.B - Get Report) 2017 annual meeting. If self-driving trucks become predominant on the roads, it could steal business from Berkshire owned railroad Burlington Northern, Buffett hinted. Other technical risks must be addressed before autonomous semi-trucks are on the road, namely hacking. "If a bad person can hack into a truck, it becomes a missile," said Sterling. Nevertheless, while autonomous driving may be a problem for tomorrow, it is not something trucking companies should discount today. "It will be hard to recruit people if a company is complaining about not being able to recruit new drivers and at the same time touting automation," Deniz said, because drivers know their jobs will eventually be replaced by technology.